I expected the stadium to be packed, but as you’ll soon discover, that wasn’t the case. I snagged one more ball during the Yankees’ portion of BP — a home run by Eduardo Nunez that sailed over my head and landed in the last row. I should’ve caught it on the fly and certainly *could’ve* caught two others, but the sun was brutal, and wind was strong. Yeah. That’s my excuse. I’m sure it’s fun to play around with that glove — but seriously, Luis?! 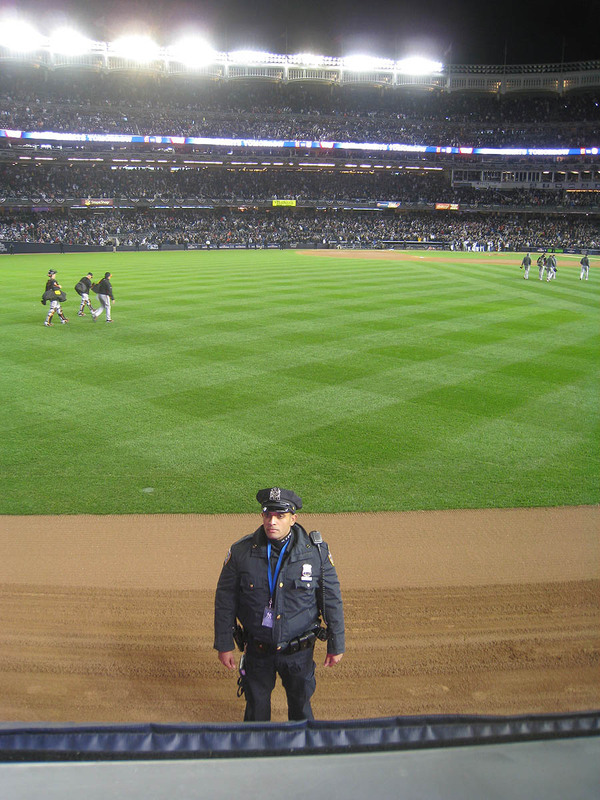 Before the decisive Game 5 of the American League Division Series?! That doesn’t seem like the best time to clown around. I’m not sure how his device worked, but I can tell you that it really sucked. He struggled with the ball for a solid minute, somehow didn’t get spotted by security, and eventually managed to reel it in. Not surprisingly, when he tried again several minutes later, he got shut down. 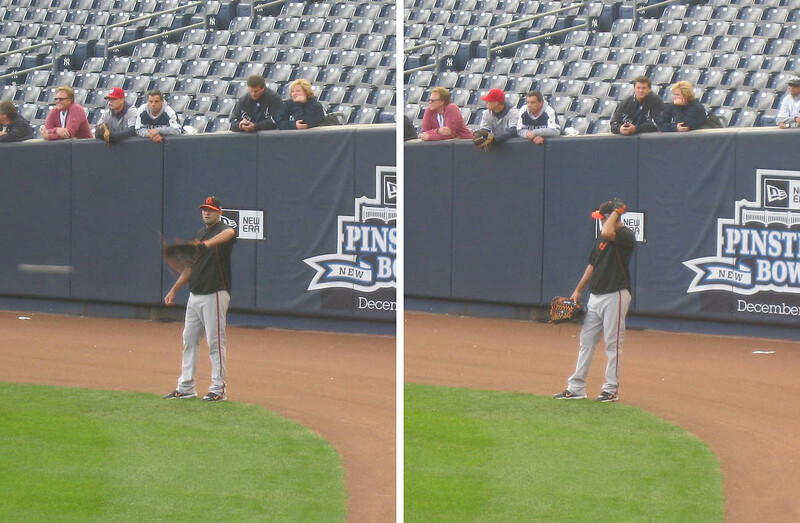 As for me, I got completely shut out during the Orioles’ portion of BP, and it didn’t make any sense. 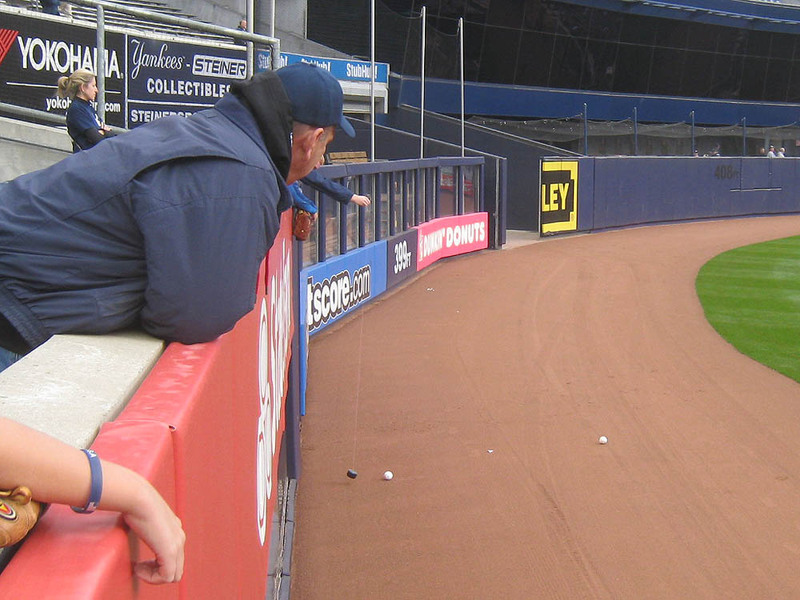 Remember when I snagged 14 balls at Yankee Stadium on the final day of the regular season? That’s how crowded the seats were at Game 5, which is to say . 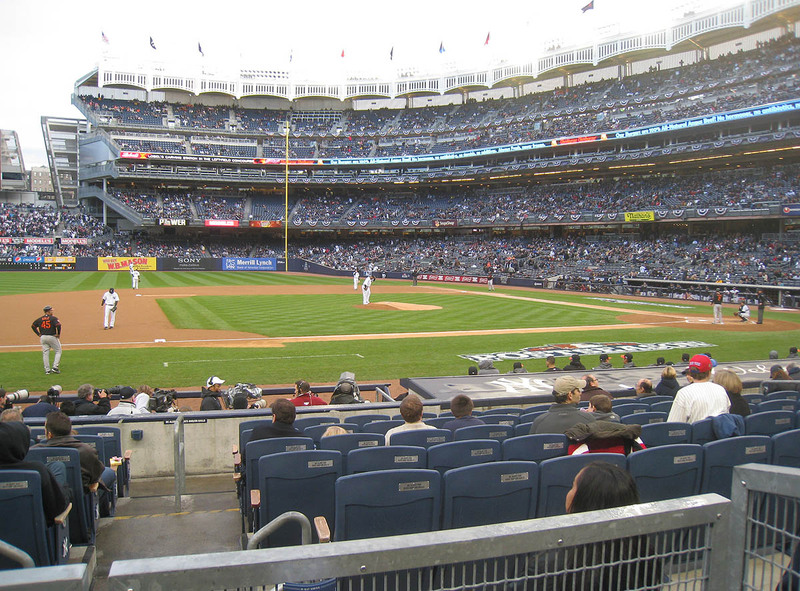 . . not terribly crowded by Yankee Stadium standards. 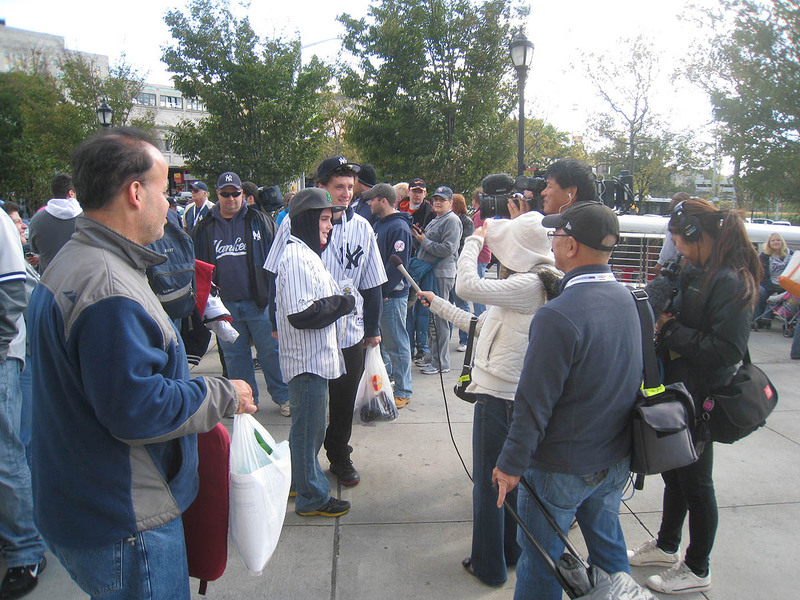 There were lots of Orioles fans, so it was tough to get toss-ups, and the batters weren’t hitting many home runs. Even so, with slightly better luck and a tad more awareness sprinkled in, I could’ve ended up with five or six balls. Things just weren’t going my way, and I’ll admit it: I wasn’t on my game. It also didn’t help that the Orioles cut BP short and cleared the field at 4pm. That was more than an hour before game time, but I still blame myself. The photo above shows my (partially zoomed-in) view to the left. There were huge patches of empty seats in all three levels, and sure enough the attendance for this game was later announced at 47,081. That’s 3,416 *below* the attendance two days earlier for Game 3. Was it the 5pm start-time on a weekday? 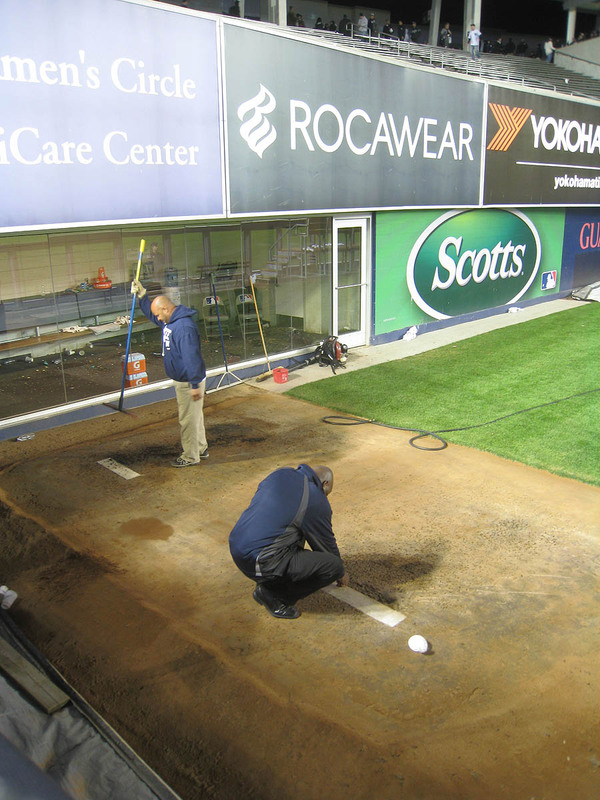 I don’t get it, but I do know this: it doesn’t speak well for the stadium or the Yankees’ fan base. Do you remember when the Braves failed to sell out a bunch of playoff games and everyone made fun of the fans for being spoiled and apathetic? 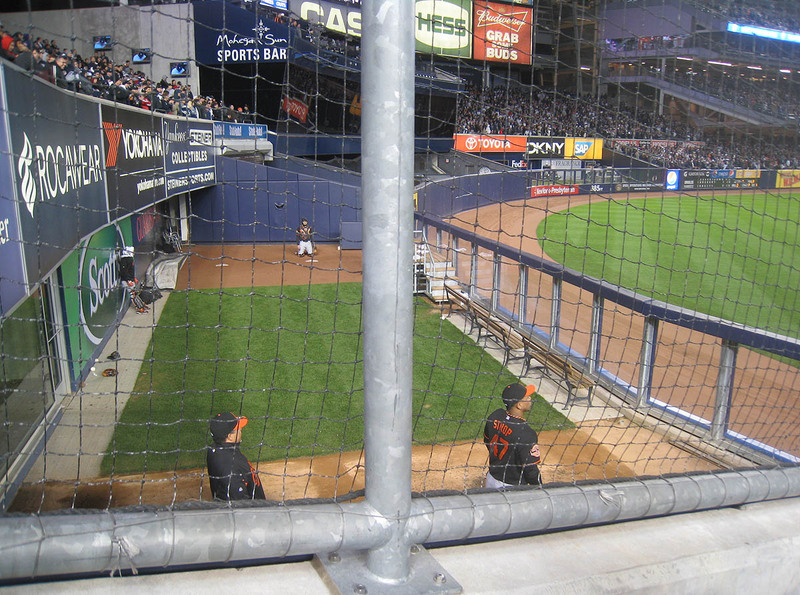 He had purchased the two corner seats at the back of the section next to the bullpen, and he was kind enough to let me hang out there with him for the final few innings. Poor Orioles. I really really *really* wanted them to win. For the first time in more than a decade, they were actually good enough to beat the Yankees. They just fell a bit short. Having been to both teams’ stadiums for a playoff game within the span of one week, it was obvious which fan base wanted it more. I always like to quantify things, so it’d be nice to say something like, “Camden Yards was 10 times louder and more intense,” but that would be an insult to Camden Yards. There was truly no comparison. It felt like Orioles fans were going to erupt in the biggest celebration of all time, whereas Yankee fans were merely preparing to call into the Michael Kay Show and complain (for the zillionth time) about A-Rod. A-Fraud. A-Roid. Gay-Rod. Earn your Pay-Rod. Not Today-Rod. Go Away-Rod. It’s so tiresome. It doesn’t matter that the Yankees wasted $29 million on him this year, or that they’re gonna have to waste $28 million on him next year, $25 million in 2014, $21 million in 2015, $20 million in 2016, and $20 million more in 2017. Why? Because they’re the Yankees. They spend money. That’s what they do. 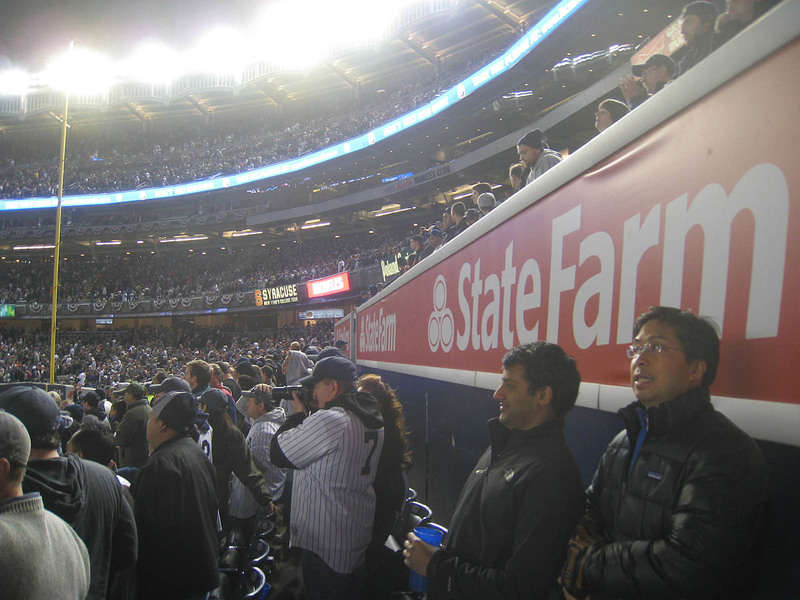 Yankee fans were thrilled when Joe Girardi benched A-Rod for Game 5, but guess what? Eric Chavez, his replacement at 3rd base, went 0-for-3 with two strikeouts, and no one said a word about it. If the Yankees had lost this game, fans would be calling for Girardi to be fired, saying that A-Rod needs to be in the lineup everyday because HE’S A-ROD. (Play-Rod!) New York is a funny baseball town. 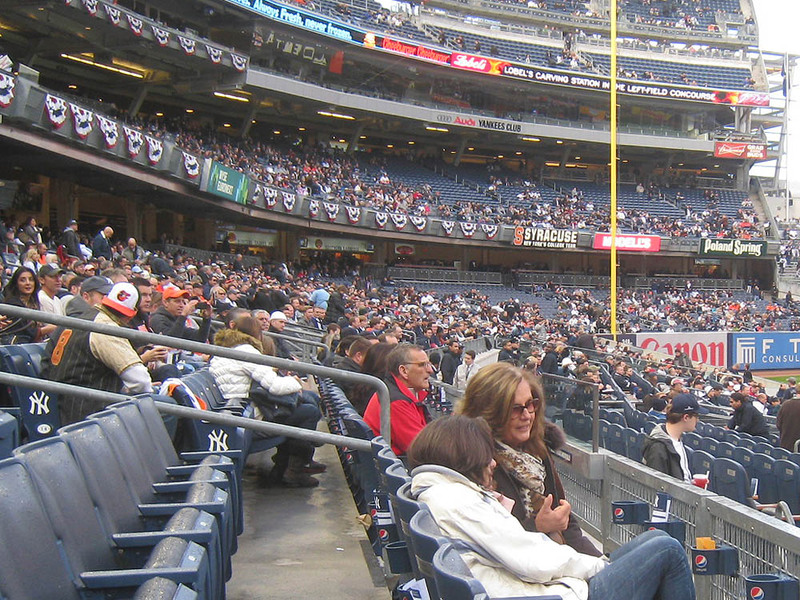 The Mets are embarrassingly inept, and their fans suffer for obvious reasons; the Yankees are embarrassingly successful, and their fans suffer because anything less than perfection is unacceptable. New York is a tough place in general — too many people, too much attitude, and too many expectations. I’m finally feeling it myself and often fantasize about leaving. But for now . . . the show goes on. I lingered in the left field seats for a while. 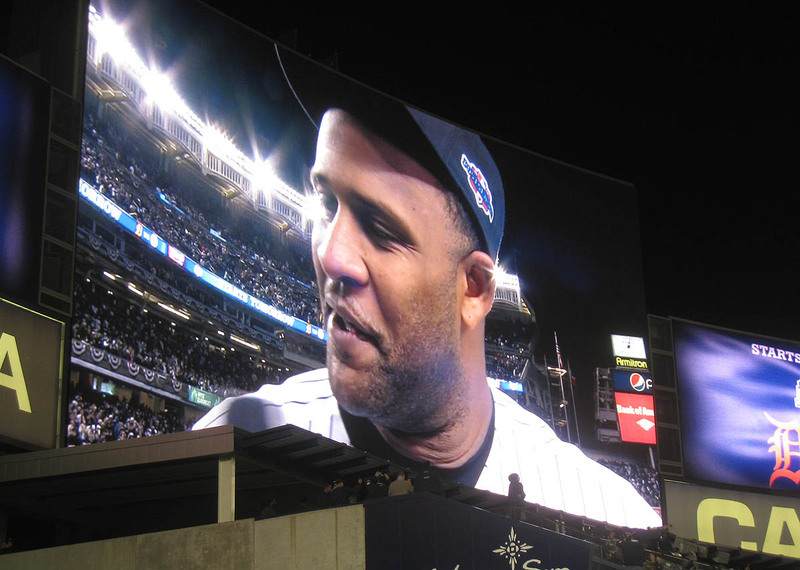 CC Sabathia was shown on the jumbotron . 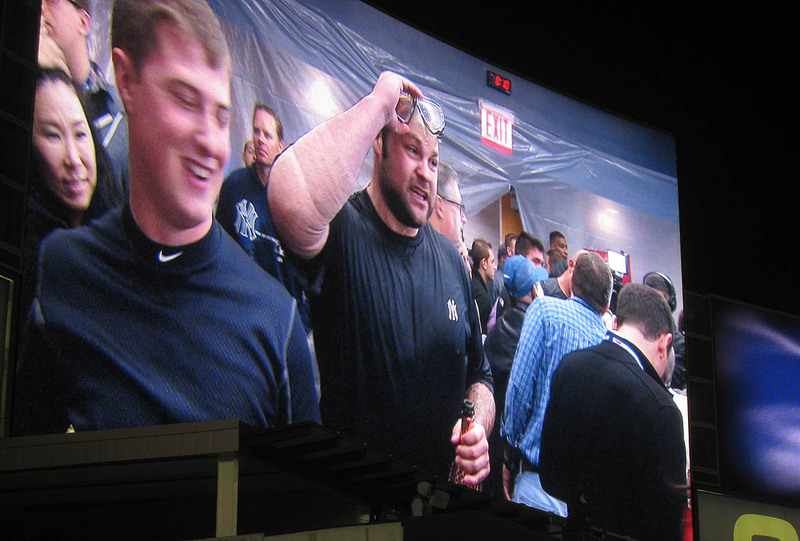 . .
1) Is it just me, or does Joba Chamberlain look like he weighs 350 pounds. He is a *large* man and, in my opinion, does not appear to be healthy. 2) Did you notice the huge wrap on Joba’s right elbow? You may recall that he was struck there the day before by a flying/broken bat — interesting to see how his arm is being treated. 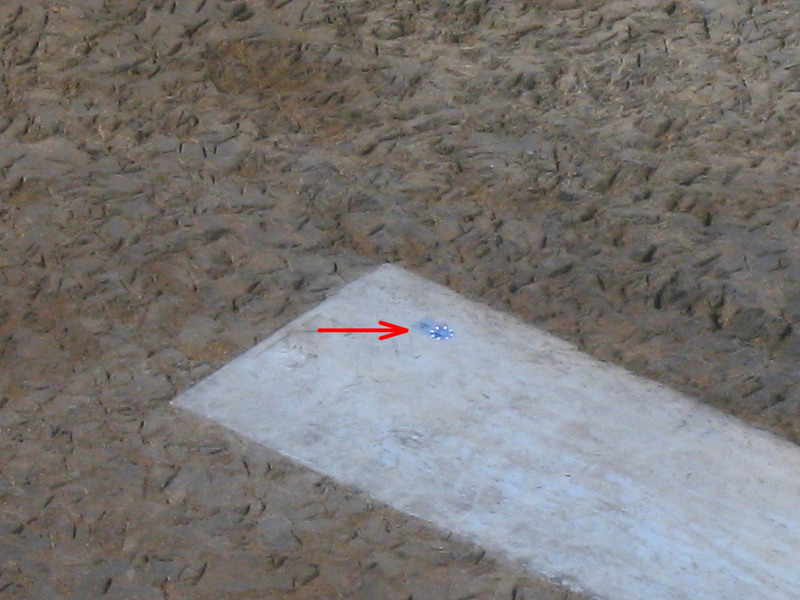 I once got a baseball authenticated — the final Mets home run at Shea Stadium, hit by Carlos Beltran on September 28, 2008 — so if you’re curious to get an even closer look at a similar sticker, click here. I have to say, though, that that is one fugly ticket. What’s with the plaid background pattern and the generic hitter? I mean, even putting an image of Clay Rapada on there would’ve been an improvement. The Ichiro foul ball that I’d gotten at Game 2 in Baltimore had a messed up logo. (I know, I know, poor me, right?) I’m talking about the part that says, “OFFICIAL BALL 2012 POSTSEASON.” It was so worn (as you can see in this photo) that I could barely read it, so it’s nice to have another that looks better. 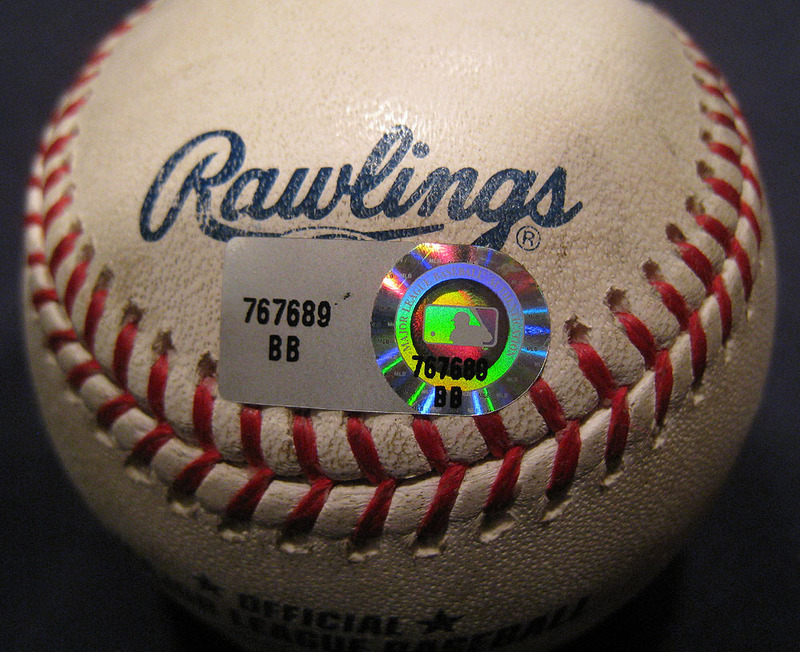 Of course, the “postseason” logo on this new ball is a bit scuffed, but hey, that’s just how things go. • 640 balls in 80 games this season = 8 balls per game. I woke up, turned on my computer, went to mlb.com, and saw that the Cardinals had won. They just won’t lose. Between the playoffs this year and last year, they hate losing. I wondered if you would go to this game. 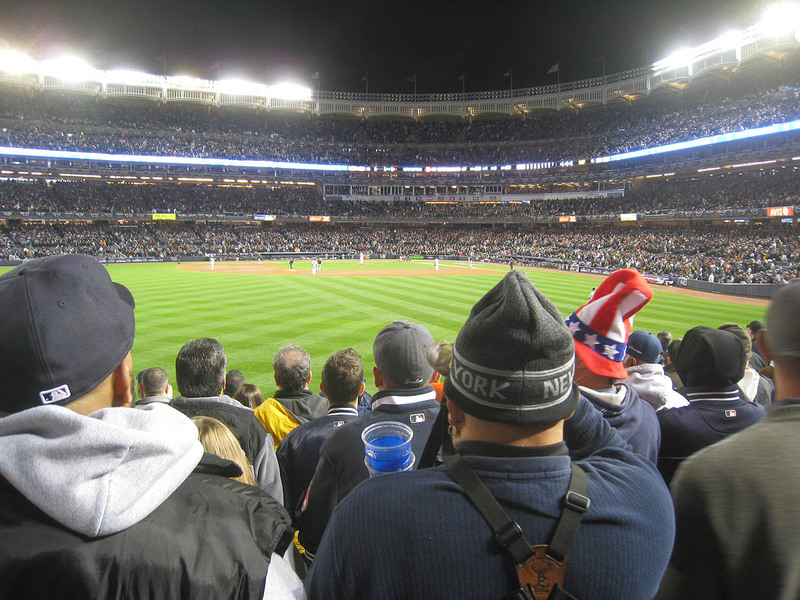 If the World Series happened to be in New York (I hope it is not), do you think you would go? 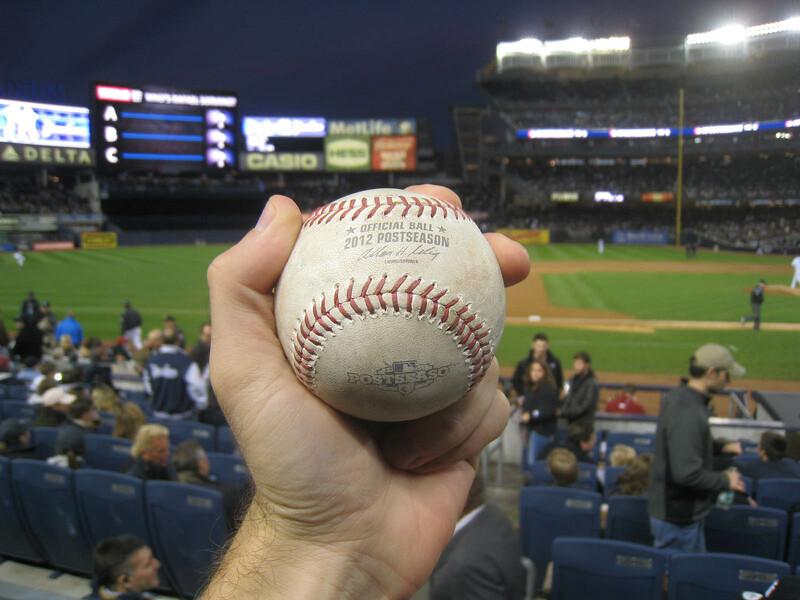 What are the odds the Yanks have a few of these laying around for BP in 2013? And as for Joba, every time he comes out he just looks disgusting. I went to game 4, and was only able to get one ball, which I gave to a kid, who I realized it was intended for, and my Dad found an easter egg in the right field bleachers – nice job on the postseason ball. I was (and still am) truly stunned by their comeback. The odds are very slim. Extras will probably be sold in the team store. Not bad — one ball apiece at a playoff game. I’d say it’s more of a “serviceman” trick. You oughta cut those NY fans a break, Zack. 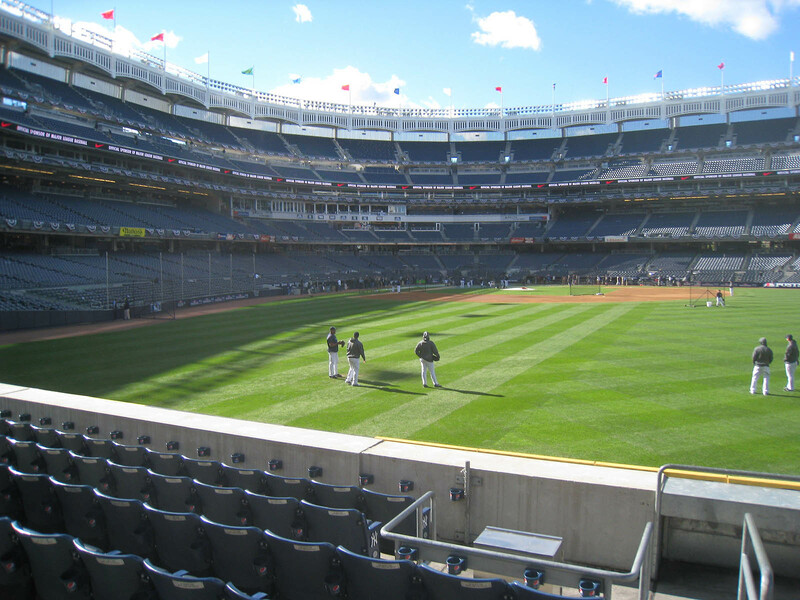 It’s not like the Yankees have an astronomically giiiiiinormous pool people from which to draw fans into the stadium. I mean, isn’t Baltimore something like 200 times bigger than NYC? Okay, in all seriousness, look back at your ALDS Game 1 entry and check out the prices on those tickets. I was amazed and happy to see that the Orioles didn’t totally gouge their fans for playoff tickets. Those price seemed very reasonable to me. 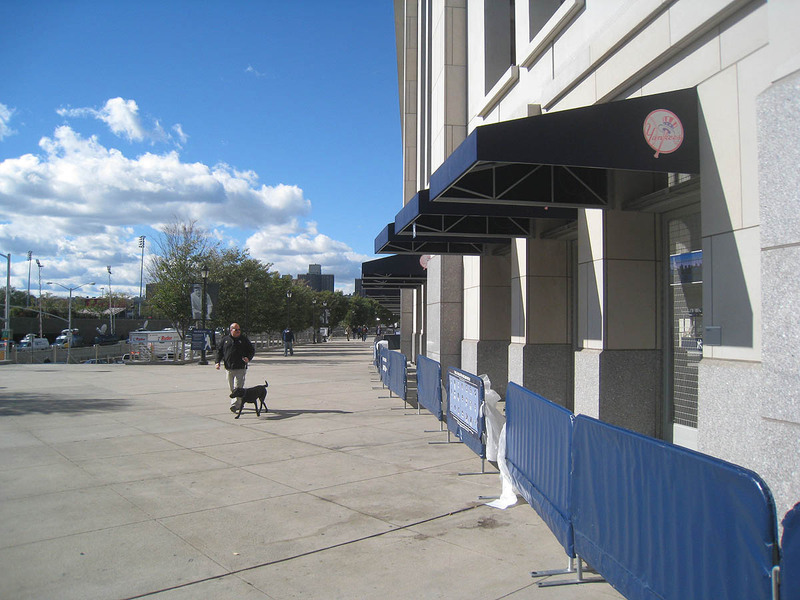 And, frankly, the Orioles playoff tickets appeared to be cheaper than Yankees regular season ticket prices. 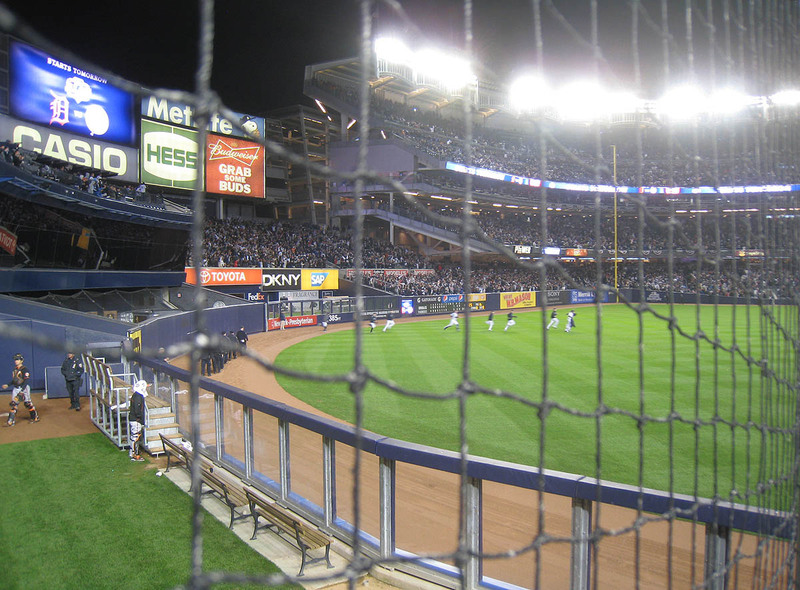 It baffles me why the Yankees, who have no shortage of fans, haven’t corrected their overpricing since the new stadium opened. Seems like they could lower prices a bit and sell more tickets without losing revenue. I would agree, those tickets are very fugly. I remember when my Wild Card tickets arrived in the mail, my first thought was how awful they looked. However, the tickets that the season ticket holders get are red and much less ugly. Oh, and am I the only one who feels like the batter on the ticket kind of reminds me of David Murphy? The face and swing put together reminded me of him. I was trying to think which batter it could be. Murphy hadn’t come to mind. I was thinking more along the lines of Gregg Jefferies. Derek Jeter, Zack. WT F-ing F????? I’m devastated. Hmm, I thought they left Nunez off the roster. Jus hangin’ rao, I guess. I can see Gregg Jefferies in the swing. I would be curious to find out if it actually is modeled after a particular player or person, or if they just tried to come up with a generic swing. Loving the A-Rod rant lol. So true. I thought the post season ball was just the logo. The 2012 postseason writing makes it extra cool. Braves drew 52,000 (105%) for the same 5:00 Friday slot last week. I will say this ALCS scheduling has been terrible with fans not knowing if there would be two home games this weekend. Wasn’t J.Valverde like 47/47 last year? With a 97% save rate over the last 3 years? Just one bad inning. Maybe he can get it back together. Blanket statement are never a good idea. Did you hear what Verlander said last night about Nunez? That he (Nunez) had one of the best at-bats that he (Verlander) had ever seen. As for Valverde, it doesn’t matter what he did last year. What matters is that he no longer Has It. My guess is that it’s an actual player that was then made to look generic. It sure does, minus all the snakes and spiders. I didn’t hear that quote, but that was pretty clutch last night, no doubt. I guess they activated him after Jeter’s injury? Looking forward to Giants/Cards tonight. I’m thinking Holliday lit a fire that will be difficult to put out. I liked Will Clark’s comment about justice from the baseball gods not precluding earthly retribution. 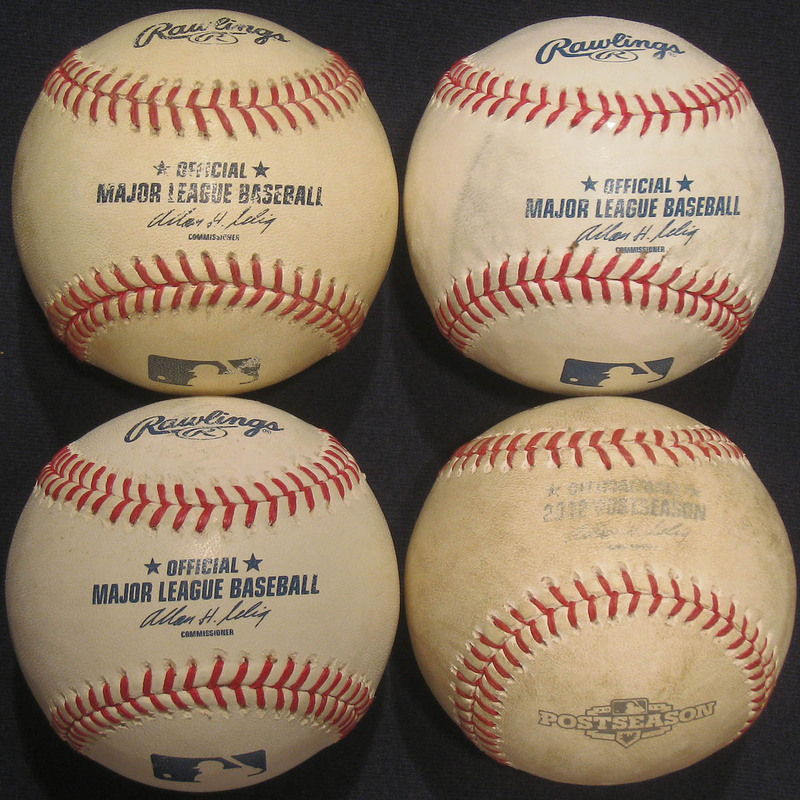 The post season balls are cool, I bet New York will have some left over next spring… What do you think? You mentioned that Andrelton Simmons has a strong arm. That’s probably because he was a relief pitcher before he was drafted. Great to see Barry turning it around!